long they can leave a bottle of Amarone in the cellar, or when is the best time to drink it or again what is the best food to pair it with. 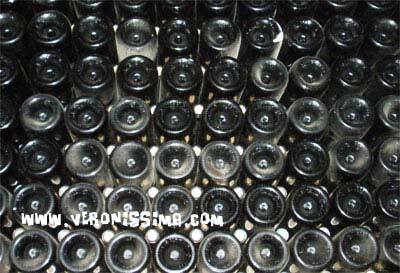 This article would like to be a quick, simple and useful tool for Amarone storage and serving. Where is the best place to leave my bottle of Amarone? 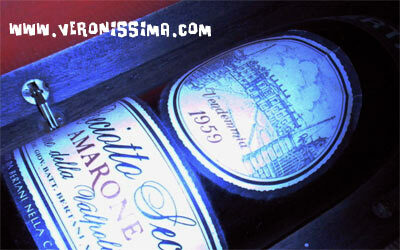 As long as it is in the right environment, Amarone is a wine that can be stored for decades. For Amarone storage applies the same rules valid for all red wines. Temperature is one of the most important factors to consider when bottle aging an Amarone. Ideal temperature ranges from 11°C (51°F) to 16°C (60°F). The most important thing to avoid is fluctuating and fast changing temperatures that can quickly ruin wines an allow oxigen inside the bottle. Ideally, inside the cellar or storage room there should be only few degrees change between Summer and Winter. Humidity is also vital. With a humidity range between 50% to 70% the cork of your bottle of Amarone will remain moist and properly sealed not allowing any air in. Darkness is also important. All Amarone bottles are generally made of thick, dark glass but nevertheless it is also important to avoid direct exposure to light and of course Sun. Amarone must remain in complete darkness. If, for any reason this should not be possible, bottles should be placed in cardboard or wooden boxes or at least covered with a thick cloth not letting any light through. Bottle position. Amarone is always sealed with top quality natural cork and should be stored on its side or with an angle that allows wine to stay in contact with the cork, so that it will not dry out maintain a tight seal. How long can I leave the Amarone in a cellar? Many producers in Valpolicella proudly say that you can forget their Amarone in the cellar. It is true that Amarone is one of the longest ageing wines in the world, but not all the Amarones are the same, and their ageing time can vary greatly. It is important to know proper ageing time of different Amarones in order to avoid spoiling it in the cellar. General rule is that a longer ageing time in barrel will give the Amarone a longer life in bottle. 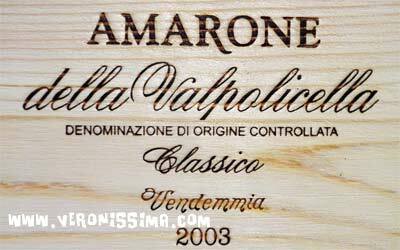 With new DOCG (Italian top quality label) rules wine makers are now allowed to release their Amarone on the market after 2 years of aging in barrel. Shorter maturation times are achieved with the use of toasted French oak barriques of 225 liters. With a small volume/surface ratio they allow a faster oxygenation. This helps to shorten ageing time but it also shorten the bottle storage life of an Amarone. When you buy a bottle of Amarone it is very important to know how wine has been made. An Amarone aged 2 years in barriques should be drunk in 8-10 years. It is just a suggestion, probably your Amarone will still be excellent even after this time, but if you do not want to run the risk you should stay within this limit. Amarones ageing in big un-toasted oak casks for longer time, 5, 6 or even 8 years, after bottling can be left in the cellar for longer time, 15-20 years to be on the safe side, but easily more. In Valpolicella there are wineries using traditional wine ageing process that still have on sale 1960s vintages and, apparently, they are excellent. When is the best time to open a bottle of Amarone? When you buy a bottle of Amarone it is usually ready to drink. After ageing in barrels, producers usually allow other six months or one year of bottle ageing before releasing the wine on the market. You can drink an Amarone soon after buying it, but it is a wine that the longer it matures in the cellar, the better it gets, mellowing and expressing tertiary and more complex flavors. A young Amarone expresses dried fruits, dried flowers, sweet spices aromas with smooth but present tannins, and often you can still perceive some of the fresh fruity aromas typical of Corvina grape. After 10 years of ageing in bottle, an Amarone will change its taste to something smoother and velvety, developing more distinct and complex tastes of dark chocolate, tobacco, coffee and leather. After 15-20 years, and Amarone will develop aromas that modern palates might not appreciate if they are not used to such long aged wines. A wine that aged for 30 years or more will also become extremely delicate and you’ll have to drink it within few hours after opening because fast oxidation. It is important to take into consideration all these factors when deciding how long you want to leave a bottle of Amarone in your cellar. How long before drinking an Amarone shall I open the bottle? In some wine guides you might read that, when opening a bottle of wine you should allow an hour of breathing for each year of ageing in bottle. This would mean that, for example, for a 1967 Amarone (one of the oldest drinkable vintage still available on the market), you have to open the bottle almost two days before dinner. Of course, such a long breathing time is unnecessary. 2-3 hours should be enough even for oldest vintages. You should also consider the pleasure of appreciating how wine evolves after you open the bottle during a meal, how it gradually starts to express its perfumes and aromas as you keep pouring it. You will taste a different wine with each sip. Pouring each time small quantities of Amarone in a proper wide glass and swirling it few times will also help the oxygenation process. Do I need to use a decanter for the Amarone? Amarones, especially those aged for many years in big casks, are very stable and clear wines. After fermentation Amarone remains in stainless steel tanks for 4-6 months where it settles before been transferred in barrels and casks where it ages for other 2 to 6 years, allowing all sediments to rest on the bottom. When bottled, an Amarone is a perfectly clear wine and it is very unusual to find deposits and sediments inside a bottle, even after many years it remained in the cellar. Even if using a decanter could help reducing breathing time for an old vintage, for an Amarone it is definitely not necessary. Whether you are a wine expert or just a wine enthusiast, a winery tour in Valpolicella, Amarone wine producing area, will give you the opportunity to deepen you knowledge of this amazing wine. In Valpolicella wineries you will have the chance to ask all your questions about Amarone directly to wine makers and cellar masters. Our experienced wine tour guides will make your tour informative and fun designing an itinerary to perfectly suite your needs and wine knowledge.